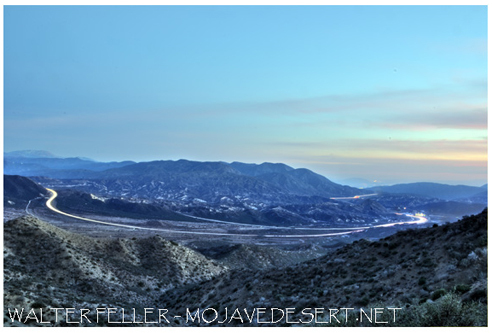 The Cajon Pass is the valley that separates the San Bernardino and San Gabriel mountain ranges. At one time these two ranges were one, formed by the San Andreas fault where two continental plates, the North American and the Pacific plates push against each other. As the years passed a low point eroded by water and helped along by additional faulting formed the valley between the two. The plates pulled away from and and pushed against each other forming new canyons, creeks and springs. 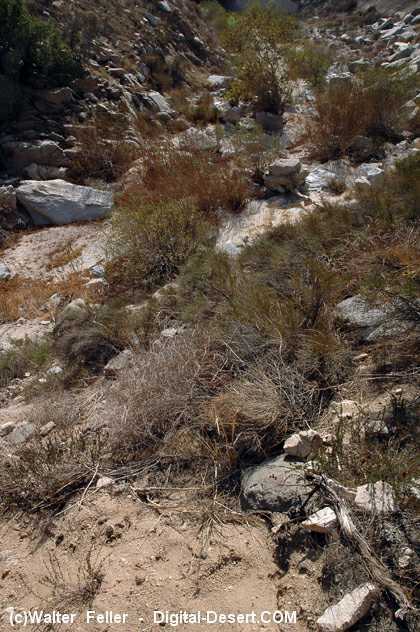 More erosion formed what is now known as the West Cajon Valley or amphitheatre leaving the slanted Victorville Apron with the headless and dry canyons we see today where the high Mojave Desert ends creating a passage into the inland valleys and basin below. Since we do not know when man first came to the land we can only guess when people first laid eyes on the rift between the ranges. Certainly early on man found his way through the pass in one direction or another in his wanderings many thousands of years ago. The Indians, the Serrano in particular, knew the valley well and lived there for hundreds, maybe even thousands of years before the first European ever found his way into the area. For this same indeterminable time the Indians used this valley and the passes and saddles in the mountains as a corridor to trade. It may never be known, but possibly the first white man to enter the passageway between the two lands could have been a deserter from the Spanish Army. What is known is that Pedro Fages, who was destined to become the Governor of California, was the first to pass through in search of these men. The deserters were said to have been living with Indians in lands not previously explored. 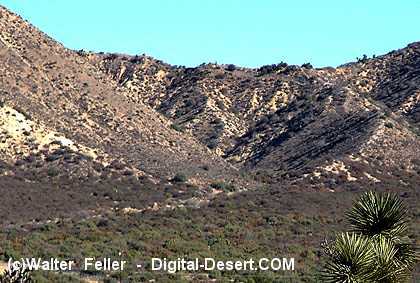 Fages rode through the area coming from the south and soon after discovering and naming the San Bernardino Valley. He did not spend long in this place. From the Cajon he rode west in the foothills along the edge of the Mojave toward the ranges that come together to form the western-most wedge of the desert. Padre Francisco Garces came soon after at the end of his 1775 crossing of the interior Mojave Desert. Some reports claim Garces crossed through one of the mountain passes to the east and others have him descending the pass into the Southern California area. Next was mountain man Jedediah Smith. Disputes are likewise to Father Garces. Soon after Smith, came Antonio Armijo with his mule train blazing what was to become the Old Spanish Trail bringing commerce between Los Angeles and Santa Fe. As trade developed the route became known and more and more the Pass was used. The Indians became absorbed into the missions and the village (Muscupiabit) was abandoned nearly completely. The horses bred on the ranchos in the south were beautiful, strong, and well-fed creatures bringing 10 times the price in New Mexico and much more than that in Missouri than could be had for them in Los Angeles. This was attractive to horse thieves. Indians running away from the missions would steal them and ride across the desert. These desparate men would join together with renegades from other bands and mountain men who were looking for a way to make fortunes stealing horses from the Spanish and later on the Mexicans. The most famous of these was a Ute Indian named Walkara who became known as the 'Greatest Horsethief of all time.' Walkara, or Walker as some would call him conducted many raids, but was responsible for one raid in which 3,000, maybe even 5,000 horses were stolen. This was the largest raid ever. Mountain men such as Pegleg Smith and possibly several others joined in. One night these volunteers and fifty or so of Walkara's band of renegades used the Cajon Pass as one of the corridors to make their escape. It was said that the dust of the galloping horses could be seen for 50 miles as they raced across the dry desert plains. The Mormon Battalion disbanded and many crossed the desert to return to Salt Lake. They were the first to bring a wagon up the pass at the beginning of their journey. A year later Captain Jefferson Hunt, familiarized with the trail by this trip was contracted to lead a party of goldseekers across the desert and down through the pass into California. The wagons they brought were larger and much heavier requiring them to be dismantled and carried over the rocks near the bottom of Coyote Canyon as they entered the main portion of the Cajon. This was very troublsome and caused much difficulty. 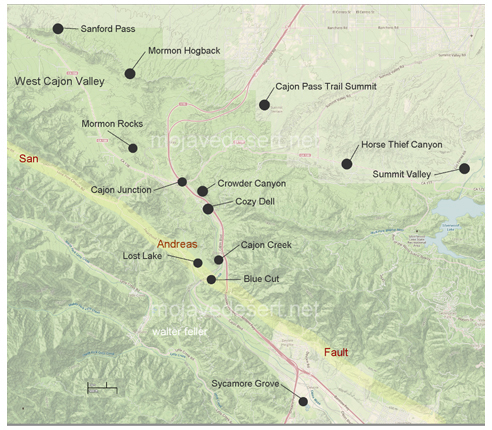 Other trails into and out of the pass were sought and developed. Maintaining the wagon road was a difficult job. John Brown was contracted to build a toll road affecting a clear path through the pass. The toll road, however became quite controversial and people found ways to bypass it. The railroad came through the pass in the 1880s. This was a faster more economical way of moving goods to and from the rapidly growing state of California. The toll road eventually became the alignment for a paved road as automobile travel became more frequent. This road was called the National Old Trails Highway. This highway in turn became the U.S. Route 66. As America became an automobile culture, mobile hotels (motels) and reststops were developed to make the journey more pleasent. Of course repair services and restaurants were included in the roadside ammenities. A cut in the grade to the summit of the Cajon was made and eventually widened to accommodate State Highway 91. In later years the highway was widened again and became what we know today as the Interstate 15 Freeway. Cajon: the Spanish word for 'box' was used as a geographical term to describe boxlike canyons. It is included in the names of five Mexican land grants or claims-all in southern counties. 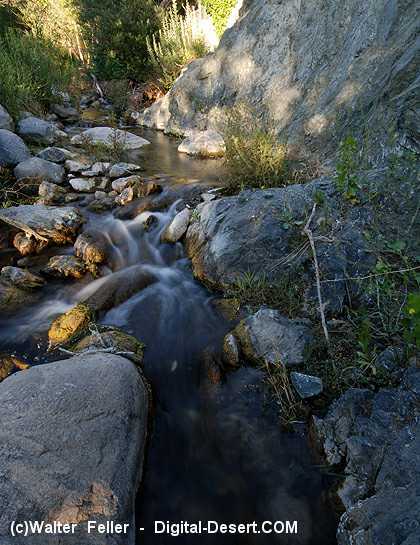 Cajon: Pass, Canyon, Creek, town [San Bernardino]. the original Cajon was el cajon que llaman Muscupiavit (the canyon that they call Muscupiavit), as it was referred to before 1806, Muscupiavit being an Indian rancheria, the name of which has been spelled in various ways. On November 24, 1819, Padre Nuez named it solemnly el Caxon de San Gabriel de Amuscopiabit, the name appears in the following decades with various spellings. The abbreviated form Cajon Pass, is used on Gibbes' map of 1852. The town was laid out when the California Southern Railroad (Santa Fe) began operations through the pass in 1885, but a settlement called Cajon had already appeared on Williamson's map of 1853. Only miles from Southern California proper the Mormon wagons descended Coyote Canyon to find the would have to unload and disassemble their wagons then carry them over the rocks in order to continue. To avoid the trouble of unloading and reloading the pioneers tried descending the Mormon Hogback several miles to the west. As the wagons moved on water was finally plentiful in the creek at the lower narrows. The ordeal was at an end or beginning depending on which way they were heading.